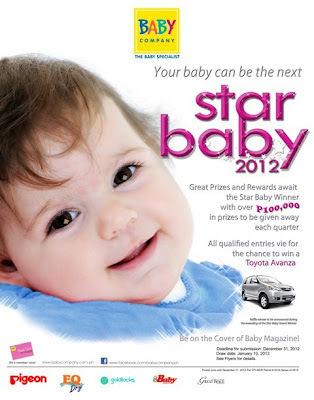 Star Baby 2012 ~ Philippine Freebies, Promos, Contests and MORE! The search for the Star Baby 2012 is on! Now, with bigger and better prizes. If you think your baby deserves the title, pre-register at any SM Department store branch and check if you have reached the qualifying amount of purchases to get a Star Baby registration form. Upon registration, you will also be entitled to one (1) raffle entry for the grand draw. Submit the needed requirements and wait for your baby's name to be drawn. Prizes at stake for the Star Baby grand winner are P20,000 SM GC, P5,000 Goldilocks GC, P6,000 worth of Johnson's Baby Products, Star Baby Grand Winner Cake form Goldilocks, Go Grand 16×20 Portrait with frame from Great Image, Baby Photobook from Great Image and an opportunity to be featured on the cover of Baby Magazine. There will also be an online poll for the Quarterly People's Choice and will take home Precious Collection 1 11R (or equivalent ) Portrait Package from Great Image, DVD slideshow of images from Great Image and Johnson's Gift Pack worth P1,500. For the grand raffle draw, one (1) lucky winner will drive home a Toyota Avanza (1.3 J 5-Speed M/T). Quarterly Winner: One (1) winner per region (Luzon, Metro Manila, Vismin) will EACH receive the ff. "All photos and documents submitted automatically become the property of Nursery Care Corporation and SM Retail, Inc."